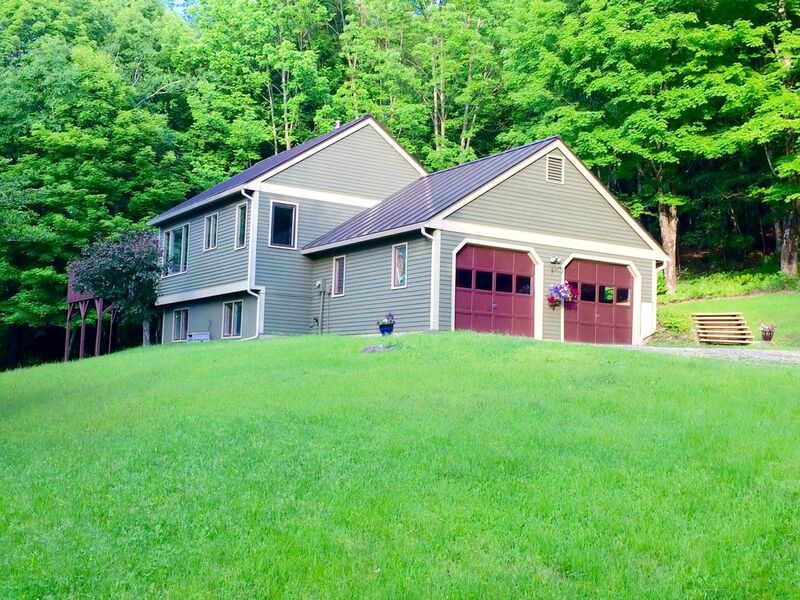 Our home offers true Vermont beauty, complete privacy, and total comfort. At first arrival you get an immediate sense of peacefulness and the feeling of life slowing down. The air is clean and crisp and there's no one to bother you. We have amazing views and great trails & woods to explore. Our home lies nestled among some of Vermont's most beautiful mountains. We are located 30 minutes from Burlington, Stowe, and Montpelier. We are also close great restaurants, excellent breweries, Ben & Jerry's, and many other wonderful attractions. We take great pride in providing our guests with a memorable and reliable experience. We are located in wooded area bordering Camel’s Hump State park and Robbins Mountain wildlife management area. We have excellent hiking, skiing, and snowshoeing from our backyard and nearby. From our driveway road is an expansive meadow with spectacular mountain views. Just down the road is a wonderful pond that offers year round recreation and beauty. Our home is a 3-bedroom contemporary ranch with two levels. Each level offers privacy which sets up well for accommodating couples or families. The upper level features the master bedroom with a queen bed, walk in closet, TV with cable, and an attached master bath. The upper level also features an open floor plan with a living room, dining area, and full kitchen with modern appliances. The living area is a relaxing space with a wood stove, love seat, and full couch that seats 5. The upper level is ideal for cooking and entertaining. Attached to the dining area is a deck with a table, four chairs, and a new Weber gas grill. The lower level has two bedrooms separated by French doors. One has a queen bed and the other has a full-sized bed. The lower level also has a full bathroom and a great room with a 50 inch Sony TV with cable and a premium surround sound system. The great room has a leather reclining couch and recliner. All aspects of our home are modern and have been recently updated. We also have a two car garage and outdoor fire pit for camp fires. About a half a mile from our house is Gillett pond, a 200-acre pond carved by glaciers millions of years ago. The pond is a wonderful place to enjoy the outdoors. It’s great for canoeing, kayaking, fishing, snowshoeing, skiing, ice skating, or just enjoying some fresh air and beautiful scenery. We have a canoe for guests to use. The pond is a short trip from the trail behind our house or from our road. We're fully stocked! We include high-end linens, towels, soap, shampoo, tooth paste, ironing board, hair dryer, washer/dryer, laundry detergent, dishwasher, dishware, glassware, silverware, cookware, Keurig coffee maker with coffee, blender, spices, napkins, paper towels, wood for the stove/fire pit, and dining room table that seats 6. The kitchen has a gas range/oven and dishwasher. We have everything you'll need to make your stay wonderful. -5 minutes to the Richmond center with grocery store, shops, and restaurants. -5 minutes from the long trail and Cochran's ski area. -15 minutes to Bolton Valley ski resort. -20 minutes from the big box stores in Williston. -30 minutes to Burlington, Stowe, and Montpelier. -40 minutes to Sugarbush and Smugglers Notch ski areas. My wife and I, Lauren, currently live in Richmond, VT with our newly born daughter Abigail. We recently bought the house next door to make room for our growing family. My wife Lauren is a reading teacher and I'm a CPA. We are well established in our professions and are honest, reliable, responsive, and responsible. Lauren is an avid reader and likes working on picture projects and I enjoy home brewing and golfing. We enjoy all things outdoors, especially going for hikes from our back yard or canoeing in the pond just down the road. We are blessed to have found such a beautiful place to live and look forward to sharing it with our guests. Thank you for considering staying with us. Our property offers unique Vermont beauty with amazing views. We offer wonderful beauty, yet we are so close to so many area attractions. Best of both worlds. Both baths have been recently updated and are very nice. Air conditioning on the upper level. Lower level remains cool during the summer and does not have AC. Baseboard heating upstairs. Radiant heating downstairs. High quality linens, towels, and blankets provided. Great spot in the living area to relax with a warm fire! Kerrig k-cup machine and regular coffee maker. Complete modern kitchen. Fully stocked with new dishware, cookware, silverware, glassware, spices, Kerrig coffee machine, regular coffee maker, toaster, blender, pantry items, etc. Large wood dining table seats 6. 50 inch Sony 3D TV in family room with surround sound Denon receiver. DVD player with Netflix. 37 inch TV in master bedroom. All major TV network stations plus more. Full surround sound Denon receiver. Bluetooth compatible. We have a variety of board games available. Great deck with nice scenery. Seats 4. Canoe available for 100 acre pond 1/4 mile from house. Close to great skiing and boarding. Golf course 15 minutes from house. Any questions are always welcome. The house was fantastic. The beds were really comfortable and the views were beautiful. The location is super convenient as it is close to all the ski resorts. There are hiking trails behind the property which we made good use of. Also being able to bring my dogs was an added bonus. The owner checked in on us just to make sure everything was satisfactory and we really appreciated that. We will definitely be back! Our third time here for family holiday! Love it! Lovely home! Best hospitality ever! A keeper! Gorgeous country location yet close to Burlington and everything! Our guests love visiting us here. Thanks so much Jeff and Lauren! Had a wonderful visit! The property is beautiful it is close to everything you need but is feels like you have the mountain all to yourself. It is surrounded by trees and the views are incredible. We wanted to play in the snow and we definitely got the snow! The homeowner, Jeff, was amazing. He texted on day one to ensure we had everything we needed and then cleared the snow from the steps and driveway so we could get in and out easily. My dad and I had a wonderful stay. Perfect for his privacy upstairs and mine downstairs. Amazon Firestick TV and cable allowed for us to watch what we wanted. The kitchen was great for cooking yummy food and I really appreciated the provided spices and such. Thank you for having a Keurig! I drink regular coffee and dad decaffeinated. Nice not to have to fuss with separate pots of coffee. He even used the provided shower seat. Thanks for that touch too! The bathrooms and kitchen stocked nicely, beds super comfy and washer and dryer worked great. I HIGHLY recommend this home for anyone...single, couple or families. Thanks to,Jeff for coming over to personally help with the tv. We weren't familiar with th e Firestick. The perfect hub for Stowe and Burlington areas. We did waterfalls, the Gondola ride in Stowe, shopping, Ben & Jerry's and relaxed. Thanks again for providing a great home away from home. We did a four day hiking weekend at the end of September just as the leaves were turning. Had a great time with our daughter and fiancee. The house is well-equipped and located very near the Long Trail, Camels' Hump and Burlington with its great restaurants and bars. Very good for hikers in the summer and fall and near ski resorts for the winter. Hosts were responsive to any concerns and live nearby. 5 Minutes to Richmond town - wonder restaurants, grocery store, bakery, and other shops.